I’m pleased with tonight’s Final Wager. I don’t mean the video – although there, I do offer some thoughts on how we got to this situation, with particular focus on the things that can throw you off your game during the course of a taping day. Sad, but sometimes that’s the way things shake out. Tonight’s game shouldn’t be a reflection on either Brad or Stephanie. It takes a lot of mental grit to dig yourself out of a hole – and to stay out of that hole. Even when you’re not in front of 10 million people. In 1985, 5-timer Michael Day played a single-player Final Jeopardy! in his 4th game. Great stuff, Shane and William – thanks so much! In the Tournament of Champions Yearbook, 1985 ToCer John Hnat claimed to have played FJ by himself in his second game. 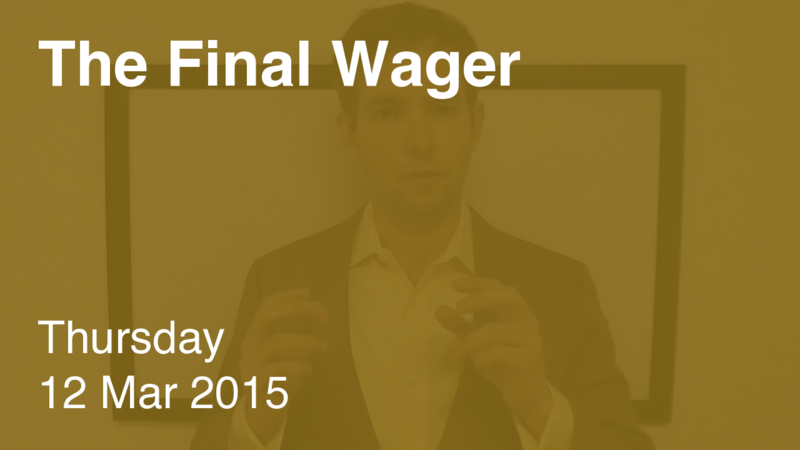 Strictly from an expected value perspective, those are the only two wagers. Is the $-6800 the new all-time record for low score? In one of Dan Pawson’s game, the record was set at -6200 by a challenger and on her bio page on the J-Archive it said the previous record was -3700 in pre-doubled scores so technically the record is -7400. That lowest score thinking is only in the doubled values era. Someone tied it before in the 80’s and in the same decade, someone got $-10,800, with of course a negative $-5,400 recorded in that game.